What has been seen cannot be unseen. Perhaps that’s a cliche, but believing you can “un-see” something is the lie that the photojournalist in the heart of “Unseen” unsuccessfully tries to live by. Currently running at The Gift Theater in Jefferson Park, “Unseen” tells the story of American photojournalist Mia (played wonderfully by Brittany Burch) in Istanbul, Turkey, a few months before an attempted coup in 2016. 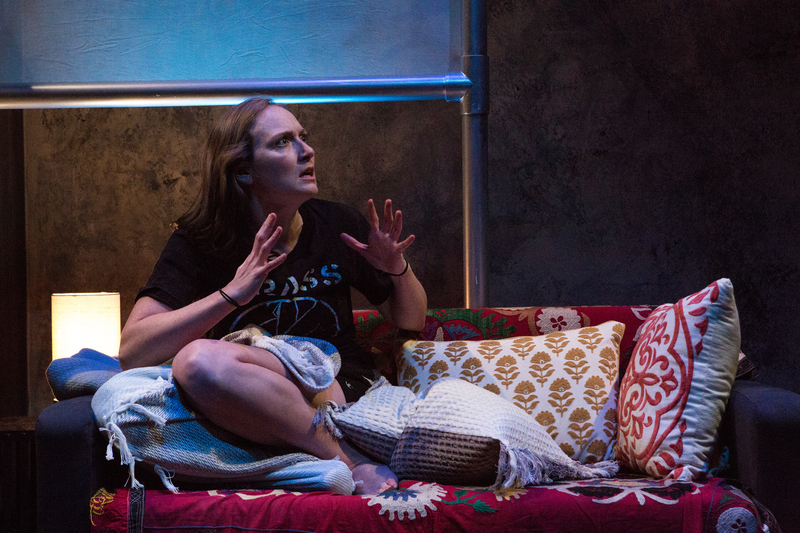 The play begins with Mia waking up in the apartment of her ex-girlfriend Derya (Ashley Agbay), not knowing where she is or how she got there after passing out in the midst of covering a massacre. Written by Mona Mansour and directed by Maureen Payne-Hayner, “Unseen” goes back and forth in time; to her trying to figure out why she can’t remember what happened; to when she was first hired by a cynical photo editor; to the time before passing out and then back to the present, when her mother (played by Alexandra Main) travels from California after getting word from Derya that Mia may possibly be using drugs again. Both Agbay and Main play more than one role, with Agbay playing Mia’s former girlfriend and mothers of children who have been killed and Main playing Mia’s mother and photo editor. But the star of the play is definitely Burch. A graduate of the School at Steppenwolf and an ensemble member of The Gift Theater, I felt like the audience at “Trelawny of the Wells,” the 1975 play in which Meryl Streep made her debut, must have felt. Keep tabs on Burch, as I expect continued greatness from her. The photo editor’s advice may seem a stretch, depending on how literal you like your theater — but it seemed more of a metaphor than anything and it worked well. That said, the play has a couple minor flaws — Mia seems a bit green despite being 35 and having covered foreign conflicts for two years, and I would have like to see the reason why Mia and Derya are no longer lovers but still apparently friends flushed out a bit more — but Burch’s performance more than makes up for these issues that I concede are debatable. “Unseen” is 80 minutes with no intermission and runs through April 9. It is highly recommended.